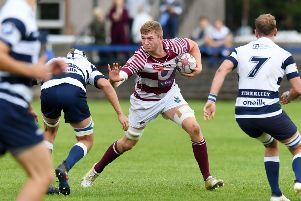 Nick McLennan has been drafted in to the Edinburgh Rugby team to face Bordeaux Begles tomorrow night after full-back Jack Cuthbert failed to shake off a viral infection. The Capital side can secure qualification for the quarter-finals of the European Challenge Cup if they defeat their French counterparts at BT Murrayfield in the last round of fixtures in pool 4, although they could find themselves overtaken by both Bordeaux Begles and Lyon, who play whipping boys London Welsh, if they lose. McLennan’s introduction to the team is one of two changes made by coach Alan Solomons to the team that narrowly lost 21-19 in Lyon last weekend, with flanker Hamish Watson coming in to replace Roddy Grant on the openside. There is no place in the 23-man squad for recent Scotland call-up Hugh Blake as he is not registered for European competition. He is instead likely to play for Melrose against Heriot’s at Goldenacre on Saturday. • Edinburgh team to face Bordeaux Begles at BT Murrayfield, kick-off 7.45pm: McLennan; Fife, Scott, Burleigh, Visser, Tonks, Hidalgo-Clyne; Dickinson, Ford, Nel, Bresler, B Toolis, Coman (c), Watson, Denton. Subs: Cochrane, Sutherland, Andress, McKenzie, Grant, Kennedy, Te Rure, Strauss.